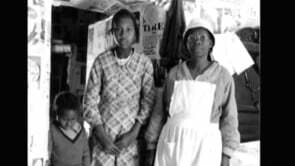 Oldest sister of quiltmakers Allie Pettway and Lutisha Pettway, Sweet T. Pettway pursued the same two pastimes as her sisters and many Gee's Bend women: quiltmaking and gospel singing. Her neighbor and friend, Mary Lee Bendolph, remembers doing both with her. She was a lovely, prayerful lady, the sister of Allie and Lutisha. She mostly sit down a lot, didn't do much work. She couldn't stand the sun, was kind of sickly. Tried to help people much as she could. Loved going to church, go all the time. She lived across the street from me and most every evening she come over here after I come home from work, sit down and talk to me, talk about the church, or sit down and piece quilts sometimes, tell me, "Girl, sit down and rest some, talk to me, you don't need to work all the time. You'll live longer." She be talking about the Lord, what he done for her, how he answered her prayers. She'll sing, she'll sing on her porch, sing on my porch with me. Mostly she don't sing the song but just do the moaning. Lots of time I hear her over there just a-moaning. One time she be sick, and didn't have nobody to wait on her, but she didn't want to tell nobody about it. Got worser and worser, weakened her down, and passed. She didn't want nobody with her when she die. We was all in the room and she was breathing hard as she could, trying to keep going. We left the room, time we looked back in she was gone. Most people want to give it up when they're alone, don't want nobody standing over them.